Mount Rainier is a stratovolcano that started to grow about half a million years ago and has erupted as recently as 1,100 years ago. It is located approximately 90 km SE of Seattle, WA. The primary hazards associated with Mount Rainier's eruptions are debris and mud flows. In most cases, these flows were triggered during times of eruptions, both as shallow earthquakes shook loose unstable portions of the upper volcano and as hot lava and rock debris melted glacier ice. Mud flows have swept down all of the river valleys that head on the volcano, including an event about 500 years ago that was not associated with any known eruption. Some mud flows have traveled as far as Puget Sound, and much of the lowland between Seattle and Tacoma is formed of pre-historic debris from Mount Rainier. 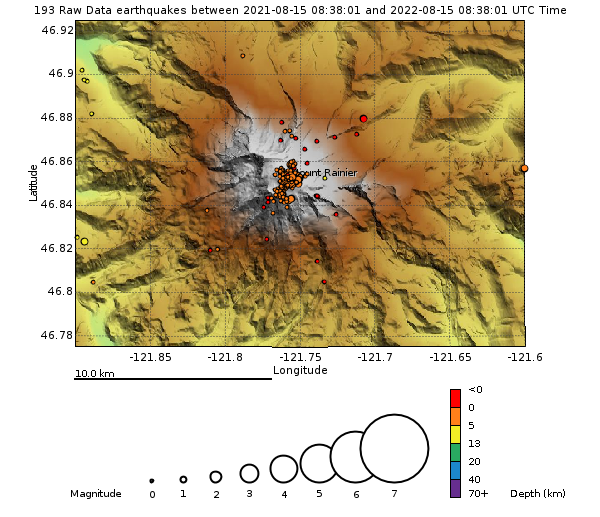 The Cascades Volcano Observatory and the PNSN cooperatively operate 11 seismometers on or near Mount Rainier. In an average month, 3-10 well-located, high-frequency earthquakes are recorded near the summit of Mt. Rainier. In addition, small swarms of 10+ earthquakes over a 2-3-day time period sometimes occur. All of these earthquakes are shallow, with most locating near sea level (~4 km below the summit), and are interpreted by Moran (1997) to be occurring in response to stresses associated with the circulation of hot fluids beneath Mount Rainier. These fluids are thought to be the source for the hot springs and steam vents found at the summit and at various points within Mount Rainier National Park (e.g. Frank, 1995). An additional challenge on Mount Rainier is that its glaciers also produce small swarms of icequakes which have some characteristics similar to volcanic earthquakes. Large rock falls and/or debris flows are sometimes seismically recorded and ice avalanches are not uncommon. A common source of earthquakes near Mount Rainier is the "West Rainier Seismic Zone" (WRSZ), a diffuse zone of activity running roughly north-south along the west edge of the park. Earthquakes in this zone are thought to be primarily due to regional tectonic stresses rather than to volcanic sources. Below is a map showing epicenters from the past 15 years of earthquakes under the volcano at shallow depth (< 5 km - green symbols) and those in the WRSZ at deeper depths (> 5 km - red symbols) and spread out over a larger area. 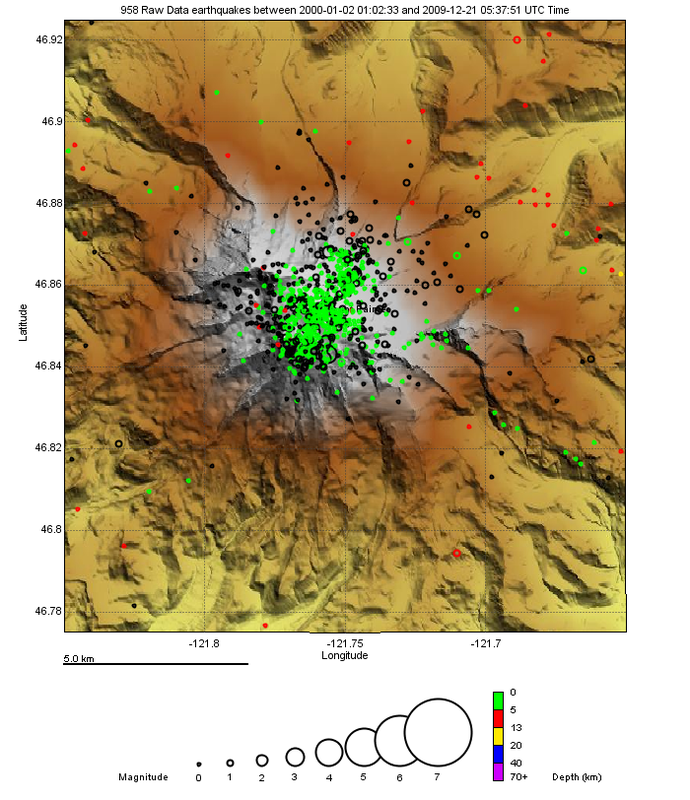 Seismicity at Mount Rainier is characterized by swarms of micro-earthquakes at shallow depth under the summit, larger and deeper events in the West Rainier Seismic Zone (WRSZ) just outside of Mount rainier National Park to the west (only partially shown on figures below) and very shallow seismic events due to glacier motion (not shown on figures below). Most earthquakes directly under the volcano occur at depths of 1-5 km below the surface; however, because of the difficulty of determining an accurate depth for very shallow events some of them have a fixed depth at the surface. 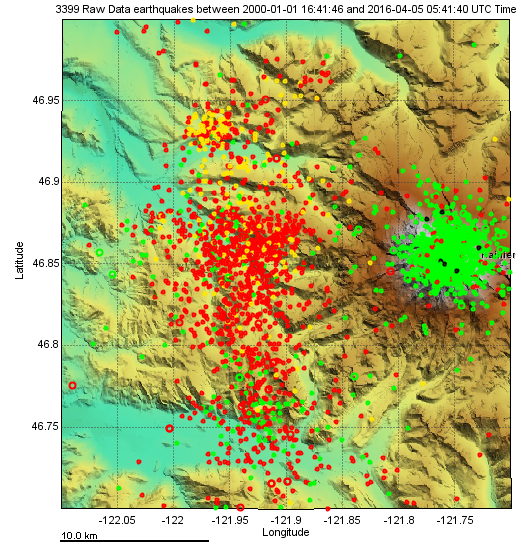 Some of these shallow earthquakes occured in swarms lasting from a few hours to a few of days. The largest event in a swarm sometimes occurs in the middle of the swarm though many follow a standard main shock-after shock pattern. The largest events in the past 20 years were M=3.2 events in 2002 and 2004, although there was a M=4.5 earthquake in 2006 located about 10 km east of the summit. The average rate of events directly under the volcano for the past 20 years is about 7 located events per month but this rate is highly variable. Below is a time-depth plot of earthquakes located directly under Mount Rainier since 2010. This plot is updated weekly until 2020 when a new plot will start... unless, of course unusual activity takes place that suggests a different time sequence is needed to better interpret that activity. Keep in mind that the PNSN earthquake recording and processing system changed in very major ways starting in 2012 and thus there can be small biases or changes introduced in event detection, location and size. We think these changes are very small but one should still be aware of this possibility. NOTE: A depth of 0.0 (zero) km is at sea level and thus events within the volcano will plot above sea level (negative depths). See the blog for more details. Here is a seismicity plot that shows the number of located earthquakes per day (black spikes) and the cumulative number of earthquakes over time (red). This can point out periods when more earthquakes were located such as a few days period in the spring of 2015 and summer of 2016 as oppossed to the very quiet period during spring and summer of 2012. Here is a map of Mount Rainier showing the epicenters (color coded by depth) for the Mount Rainier area just for the past year. Below you will find similar plots for Mount Rainier for the decades, 2000 - 2010 and the two decades of 1980 -2000. These show the typical or background levels of earthquakes under the volcano for these periods. The first seismic station located at Mount Rainier was installed in 1972 but it was not until the mid-1980s that enough stations were installed near the volcano to reliably locate earthquakes there. In 1989 the first station high on the volcano (at Camp Schurman) was installed and several others during the following few years. Thus, the obvious increased number of reported earthquakes starting in 1989 does NOT represent a change in volcanic earthquakes but rather is due to better detection levels. Since 1987 there have been a good number of seismograph stations located on (4-6) or very near (5-9) the volcano such that the regional seismic network can reliably detect and locate earthquakes of magnitdue 0.5 and larger in this area. Even smaller earthquakes, as well as glacier-quakes can be detected and located, though many are missed. Note: In this map black symbols are for events above sea level (negative depths).